The roots of this sculpture are oriental and present a clear Egyptian influence. 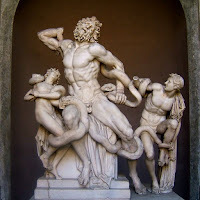 But, with the time, Greek developed their own sculpture, based on the depiction of human body. Their worry was the depiction of beauty, expression, movement and volume. The chronology signals and evolution with three periods: Archaic until 5th century BC, Classical, 5th and 4th centuries BC and Hellenistic from the end of 4th century BC to the Roman conquer in 1st century BC. The ideals appear in the depiction of human body as the reincarnation of physical beauty and spiritual equilibrium. Beauty comes from the measure and proportion and from this evolved the idea of canon. Naked human body becomes the thematic axis of Greek sculpture. Artists look for the expression, understood as the exteriorization of the feelings. In this spiritual and physical dimension mix together. But it is an idealised expression where quietness and serenity, added to perfect equilibrium, are the basis of that physical and spiritual beauty. Only during the Hellenism real feelings appear with less idealization. Greek artists tend to depict movement. They began by adapting the images to the architectonical frame to create single images or groups in which different characters are related in a dynamic way. Movement reinforced expressive values. Artists were worried about volume depiction. They quickly abandoned the Egyptian look at the front to conceit the sculpture to be seen from any point of view. Thanks to this flat depictions were left apart but for the walls and pediments. Materials used are: limestone during the archaic period, and bronze. During the classicism white marble was preferred. Many Greek works we have knowledge of reach to our times through Roman copies in marble of bronze originals. 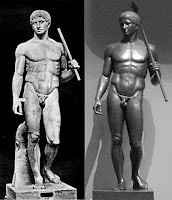 The most representative creations are the Kuros (young athletes naked) and the Kore (dressed woman, probably priest). There is a certain unity of style. In general, images are rigid, looking at the front. The kuroi are monumental, with the arms glued to the body in symmetric compositions. Hair is disposed in a geometric way, eyes are almond-shaped, articulations are rigid and they try to smile. They tried to depict with naturalism the anatomy even when they tend to geometry. Worried about life, artists followed an evolution towards naturalism. Korai were votive sculptures made of terracotta or stone that were left in tombs as a sacrifice. They are of small size (at least compared to the Kuroi) and their body is quite a flat piece of marble, a bit smaller at the belly and with a bit of volume in the breast. The character of block is more evident than in the kuroi. They are not expressive and there is a tendency towards ecstatic idealization. Their hair is rigid, following the Egyptian stile, with different levels. They were the traditional peplum, with very few folders and pretty symmetric. Their aspect is rigid, mainly in the case of those wearing the Dorian peplum, while the Ionic is more asymmetric and dynamic, with abundant folders. Geometry is a mark of identity. Transition to the Classicism. The way towards perfection. Sculpture received its impulse from the relief. Around 500 BC the pediments of Egina and Olympia were done. They are samples of composed sculptures, where the images are accommodated to the architectonical frame. They are an example of the evolution towards naturalist forms, with moderate depiction of feelings. Images adopt natural attitudes, but they still being rigid, clashing with the first notes of movement. This major flexibility is completed with a bigger thematic variety. Apart from the pediments mentioned, other good examples of this period are the Ludovisi throne, where the clothes permit the visualization of the feminine body, and the bronze of the Delphi’s Cart Rider, an ecstatic image with very expressive face, eyes that appear to be natural and polychrome in order to offer a more naturalistic image. Classical plenitude. (5th -4th BC). It is the golden age of Greek art, with the prototypes of classical beauty. It is Pericle’s century, a period of economic and political expansion. The ideal of beauty does not have just a physical dimension but a deep spiritual dimension too. Proportion and equilibrium are the basis for the Athenians citizenship that reaches a zenith with the triumph of the democracy. Miron: He was the author of the Discobolous in which he expressed his interest in the depiction of human characters in movement. The composition is ambitious and multiplies points of view. Anatomic study is correct, with well worked muscles but the expression of the head does not belong to the moment of maximum effort depicted. Polyclitus (theorist of human anatomy). His main worries were body proportions and the influence of the masses in the attitudes. In his work he theorised about the canon or rule. For him beauty stands in the harmony of the body. His work Doriforus, presents an idealised anatomy and the canon is 1/7, this is, the head is the seventh part of the body. Geometry influences in the depiction of some parts of the body, using perfect segments. The face is divided into three parts: forehead, nose and mouth. Everything is measured. The head is a perfect sphere to which hair is adapted. It is a depiction of perfection and rationality. Composition is asymmetric, with contraposto or a foot advance to demonstrate physical and spiritual equilibrium. This dynamism allowed the multiplication of points of view. Other work is Diadumenos. Phidias (Creator of the prototypes that depict the ideal of classical beauty, the scu lptor of Gods). His work is linked to Pericles and Athens. He directed the works of the Parthenon and the decoration of its walls, its metopes, triglyphs and the sculpture of Athenea Parthenos. He was reputed by the serene beauty of the faces, the flexibility and transparency of the clothes and the combination of equilibrium and life. His images are grandiose, with exquisite proportions. The relieves of the Parthenon are his best work due to the wise composition and the beauty and grandiosity of the attitudes. The technique of the wet clothes allowed him to depict the anatomy of the characters and accentuates the effect of the light on the surfaces. Late Classicism (mid 4th century BC). After the plenitude of the classicism there is a trend towards baroque sculptural forms, stylising the canons and losing the tighten orthodoxy of the complete equilibrium, harmony and proportion. This phenomenon is parallel to the historical moment of Greek history. The crisis of the democracy and the Peloponnesus Wars announced the dramatic expression that sculpture shows during this period. Realism can be seen in the proliferation of portrait. There is an intention of expressing human feelings. Religious subjects are treated as daily depictions, with more scepticism. Although classical idealism continues, sculptors tend to look for new forms or prototypes of ideal beauty. The main artists of the period are Praxitele, Scopas and Lyssipos. Lyssipos with his work Apoxiomeno created a new canon of male beauty, longer and slimmer than Polyclitus. The head is now 1/8 of the body, with longer legs and less volume of the head. The subject is also different because it is not the triumphant athlete neither the moment of maximum tension, but the moment after the competition, nothing heroic, when the athlete is cleaning himself. It created a new spatial dimension at elongating the arms. It does not look at the front and the sculpture can be seen from any point of view. Skopas represents the crisis of Phidias serenity. His images move with violence. The main are the Menade and Mausolo. Praxitele in his works created human characters full of grace and without the majesty and seriousness of former periods. His images have the impression of being dreamers. The artist uses praxitelic bend to make the images indolent, with a body that curves. In the faces he used the sfumato, polishing the marble, especially around the eyes. These good transmit melancholic states of the soul, full of nostalgic feelings. Main works: Hermes of Olympia, Venus of Arles. It is a period of great chronological and geographical wideness where Greek tradition influenced the culture of other territories that were part of Alexandre’s empire. Classical tradition and oriental influences are mixed to create and express, through the art, a new conception of the life. They continue with the technical knowledge of classicism to which they add a deep realism. Disequilibrium is preferred to serene attitudes, drama to relaxed faces, and ugliness to classical beauty. Baroque work dominate, full of intense movement and tension. Subjects are not the traditional (Gods, athletes, heroes). Artists look for inspiration in the life around themselves. The treatment is realistic and with deep psychology in the portrait, direct and sincere, without idealization. It is an attempt to individualise the portrayed person. Love Goddess is an important character of inspiration, but she appears in a great vari ety of attitudes. Daily characters and gestures are frequent. Old people, ugliness, imperfection, childhood, subjects before considered not important enough to be depicted now are the centre of sculpture. Relief reaches to depict the perspective of the backgrounds to create the illusion of deep sceneries. The unity of style of the former period is lost and there are several schools in Pergamun, Rhode, and Alexandria. Rhode: Colossus, Samotracia’s Victory, Laoconte and his sons, Farnesio Bull.